Catahoula Leopard Dog, also known as the Catahoula Leopard Hound is a large agressive cattle dog that has been bred more for it's temperament and ability than for it's appearance. They are bred to gather the rankest cattle and wild hogs in swamps and thickets, circle them and hold them at bay until their owner arrives. They are much more at home on a farm or ranch than in the city. The physical characteristics of the Catahoula are quite varied. They typically range from 50 to 95 pounds in weight and have short to very short hair, floppy ears and come in a variety of colors: blue, red and yellow, in both merles and solids. The most common is the blue merle. Spots occur in all colors. They are known for having haunting light blue "glass eyes", or half-blue, half-brown "cracked" eyes. A Catahoula will often have eyes of two different colors. The Catahoula is the official state dog of Louisiana, named in recognition of their importance in the history of the region. 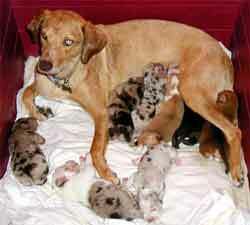 Catahoula are large dogs weighing mostly 60 to 80 pounds and are 22-26 inches tall at the withers.